In 2014 Islamic historian Fred Donner gave a talk on an very curious papyrus page dating from the very early Islamic era. The letter is of tremendous interest for reasons I will mention in this post. The text is a personal letter talking about the distribution of a sum of money among relatives. It opens with the customary بسم الله الرحمن الرحيم (in the name of God, the Rahman, the Raheem). The sender and the addressees (which are of great interest) are mentioned at the start of the text. The letter itself talks about the distribution of 26 dinars among family members and close acquaintances. Different people mentioned in the letter are assigned various amounts. The letter is very important because known early Islamic figures, including none other than Umar Ibn Al Khattaab are the addressees and subjects of the letter. The manuscript is very likely to belong to earlier than twelve years after the death of the Prophet, possibly while the Prophet(ص ) himself was alive. The clues which betrays its extremely origin is primarily the writing style employed within the letter itself. The script is decidedly early Islamic, all other documents from this era show the style of writing in this text. For example, the letter ع is written in the early script. Note that the early ع is made up of straight lines- this is easy to write for anyone creating an inscription on rock or other hard materials. The sculptor simply has to strike two lines. When pen and paper became more common, it was actually easier to write the later form of the ع- the scribe would not have to lift his pen off the paper. The two ‘teeth’ that used to make up the top half of the ع became joined into a loop. 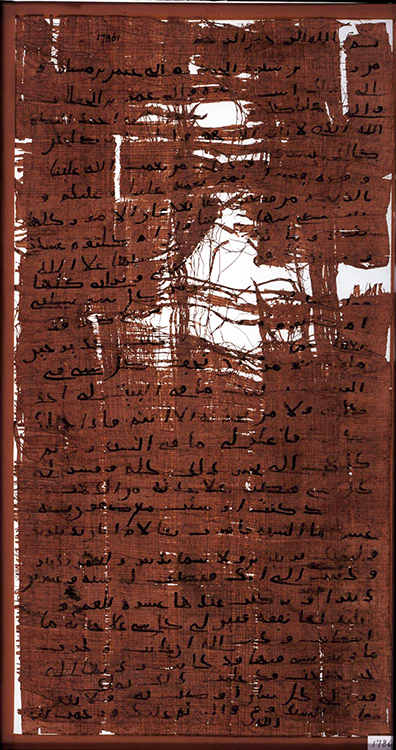 According to Donner, the earlier style of writing was very typical during the first Islamic century, and therefore the writing of the papyrus took place almost certainly before the 700s. The fact that Umar Ibn Al-Khattab’s name appears (the name is very specific: it is unlikely that this is “another” Umar given that his full title is written) is significant in determining the date. Umar began his rule two years after the death of the Prophet in 634CE and died in 644CE. As the letter is addressed to him, it was obviously written before his death. The sender assigns a single dinar to Umar, and interestingly enough does not give any honorary titles such as “Amir al Mu’mineen.” Could this letter then be before Umar became caliph? Why was he being given a petty sum by a family member or acquaintance for general upkeep- would being given charity be fitting for a community leader? Does a date earlier than the time Umar became caliph make sense of the fact that he is not given any “caliphal” titles, and how Umar is assigned 1 dinar for general expenses? Personally, I do find this convincing. That would mean the letter is at latest two years after the death of the Prophet. However, because the letter is obviously from one of Umar’s acquaintances, it may be that there would be no reason to write formal titles. What is more enigmatic is that further down in the document, we find the name “Umm Kulthum”. Is this the same Umm Kulthum, the daughter of the Prophet? Given that the name is uncommon, and if we keep in mind that the letter was sent to Umar’s circle, this does not seem unlikely. If it is indeed true, then the Prophet was definitely alive when this letter was written, because Umm Kulthum died during his lifetime. Among the people mentioned in the letter is “Umm Abban”. Could this be the daughter of Uthman Ibn Affan, the third caliph? There is also an “Asma” mentioned. Though the name is common, could this be the Asma the daughter of Abu Bakr? By themselves, these names are not particularly special. It is the knowledge that the letter is to Umar and those around him leads us to believe that ‘Asma’ could be the Asma of Islamic tradition, or that Umm Abban is indeed the same one who was the daughter of Uthman. The clues discussed above put the letter at a very early date beyond doubt. 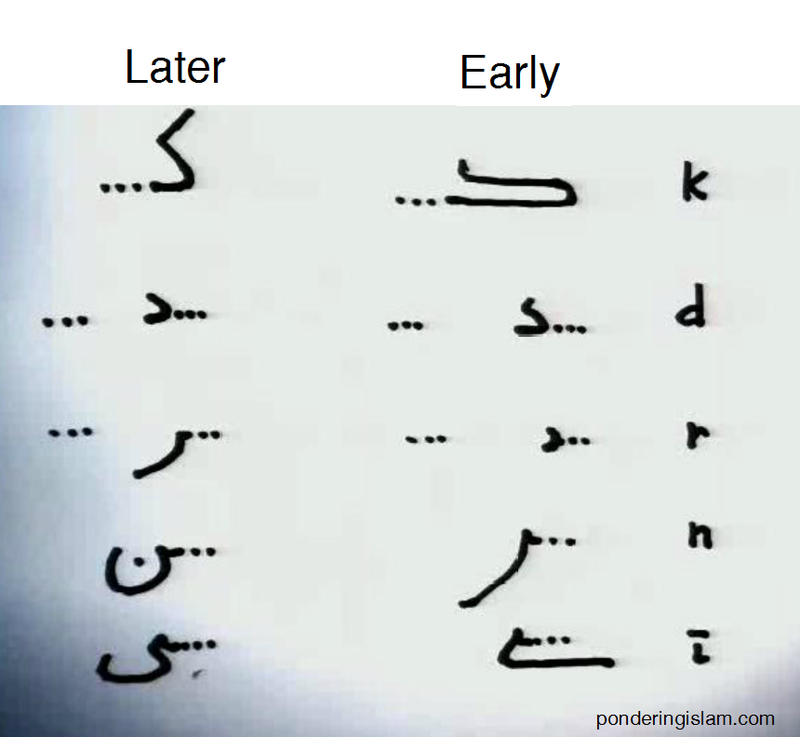 For the writing style to have been imitated by a later forger would require someone with the knowledge of early Islamic paleography, and paleography was not a science that was studied by the ancients. A forger simply would not know how to write a document like this with extreme accuracy. Moreover, there is no real purpose this document could serve for the forger. It does not really make any religious or political point. It is simply a distribution of a small sum of cash between friends and family. Its language does not contain any later quirks of Islamic writing- there is no prayers for God’s pleasure on the companions, it does not glorify any of the companions at all. This is why it was surprising that the papyrus was assigned a carbon dating of around the 9th century. There is no good reason to believe that the letter is a forgery. According to Donner, the carbon dating is inaccurate, and it is possible the letter could also have been contaminated by other material. Papyrus dating can be difficult to perform correctly or accurately for various reasons. He has had more samples sent out to different laboratories for further testing. Despite the letter being quite early it does not really tell us much, due to its very mundane nature. What is significant though is that it gives strong corroboration to the Islamic tradition on the existence of individual companions of the Prophet Muhammad. The source of this article is a lecture given by Fred Donner which is available at echo recordings (the link does not work very well- if it does not work for you, try embedding it into a html file and then viewing it. Link). I would like to express my appreciation for the effort he has exerted in finding and studying the manuscript and I await any updates on the papyrus. ← Some interesting blogs and thoughts. Such an amazing discovery!Never heard of this before.Thank you very much for sharing brother. I look forward to seeing more. Did you in the meantime cull it from Islamic Awareness? Just visited the site only to discover the same article is present there. Could you please link me to the Islamic awareness article? I wrote this myself. This article has never been on Islamic-awareness because they never wrote it! You must be confused! Bro Paul William’s ‘blogging theology’ has once again disappeared.Do you have any idea as to why? Fred Donner tested them again (Oxford): 675 +- 25 years. 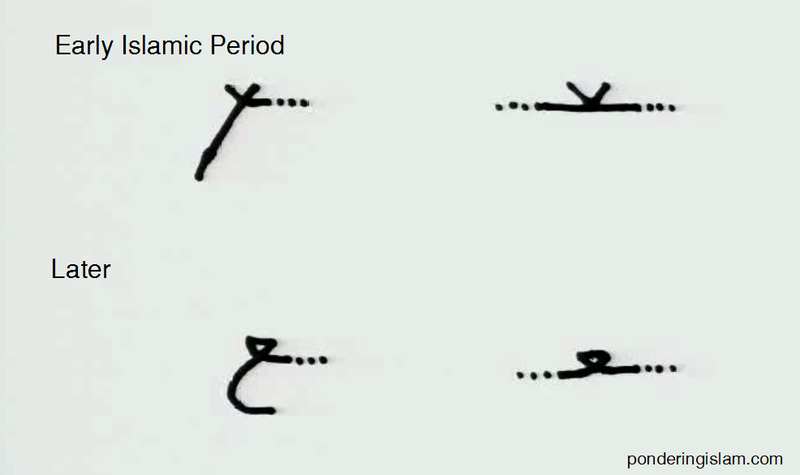 And paleographically it is undoubtedly 7th century style. Well, now I know who else to follow! It seems there are a lot of interesting discussions on twitter. Thankyou.